From Piraeus to Syros, Tinos, Mykonos, Paros, Naxos. - UNAFFECTED ITINERARIES : 25/12/09 & 01/01/10. - The itineraries to/from PAROS are valid from 02/07/09-05/09/10. To Piraeus from Syros, Tinos, Mykonos, Paros, Naxos. from PIRAEUS 09:00 to SYROS (12:20-12:35), MYKONOS 13:15. - The itineraries to/from PAROS are valid from 02/07/10-05/09/10. - 12/02/10, 15/02/10, 31/03/10, 01/04/10, 05/04/10, 21/05/10 & 24/05/10 : from MYKONOS 13:30 to TINOS (14:00-14:15), SYROS (14:45-15:00), PIRAEUS 18:45.
from MYKONOS 13:55 to SYROS (14:40-14:55), PIRAEUS 18:25. Children 0 - 5 years old : Free, with the obligation to take a zero free ticket. 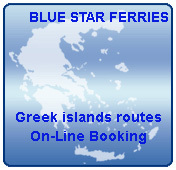 Reservation Form www.Ferries.gr @ Contact us!